Former acting director of the FBI, Andrew McCabe, says he is very concerned about reports United States President Donald Trump demanded top-secret security clearance for his daughter Ivanka Trump and son-in-law Jared Kushner, despite advice to the contrary from officials. The New York Times reported Mr Trump ordered his chief of staff to grant Mr Kushner the security clearance last year, despite concerns raised by intelligence officials. Mr Trump denied he had anything to do with the clearance. Ms Trump also told US TV show The View her father “had no involvement pertaining to my clearance or my husband’s clearance”. Mr McCabe said if the allegations were true, “people in the intelligence community [in the US] should be very concerned”. “Top-secret classification and access to top-secret materials is something that’s given only after a very thorough and careful and complete review of an individual’s fitness to have that sort of clearance,” Mr McCabe told 7.30. “The people who conduct that review are career professionals, they are not political people, they’re not influenced by politics. They make the recommendations based on the facts they come across during the course of their investigative work. In his interview with 7.30, Mr McCabe called Mr Trump a liar. “This president lies and disassembles and manipulates the facts in his messages to the American people and the world every day,” he said. Mr McCabe said Mr Trump “misrepresents the facts when he believes it’s necessary for his own survival, for his own political fortune”. “It’s an incredibly corrosive way to conduct yourself in the highest office in this country,” he added. Mr McCabe ordered an investigation into Mr Trump’s dealings with Russia during the three months he was in charge of the FBI following Mr Trump’s dismissal of director James Comey. He said the fact the FBI was investigating the President’s links with Russia “was head-spinning”. “It’s not the sort of thing that any of us anticipated we would run into in the course of our FBI careers,” he said. 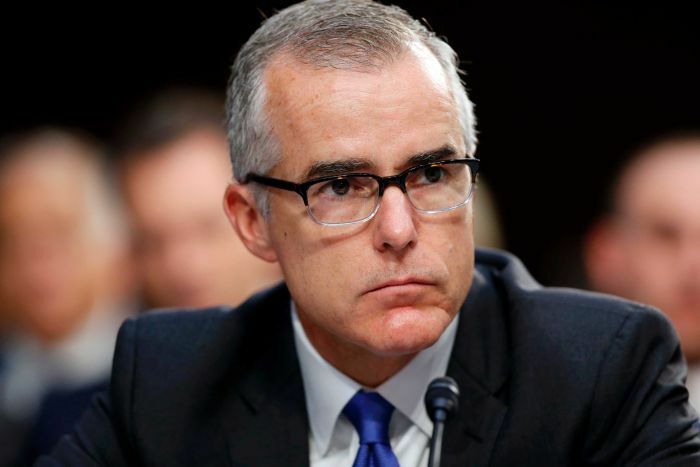 Mr McCabe was deputy director of the FBI between 2016 and 2018. He was fired in March 2018 by then-attorney-general Jeff Sessions, who cited an internal FBI watchdog report that found Mr McCabe leaked information to reporters and lied about his actions. His sacking came 26 hours before his scheduled retirement, which meant he was not able to collect his pension after a 21-year career with the FBI. He described himself as having an “unblemished record”. “I believe very strongly that I was fired because the President and his supporters were concerned about the things I had to say about the decisions I made in May 2017 [as acting director],” he said. “He has a very consistent reputation for attacking the credibility of people he doesn’t like. It’s no question the President is not a fan of mine.